Any gasket can create a seal, but a good gasket can do it with less clamping force, and for a longer period of time. Edelbrock’s gaskets are not only manufactured from extremely high quality materials, but theyre also designed specifically to fit our intakes and cylinder heads, so theres no chance that our gaskets will interfere with the operation of either component. 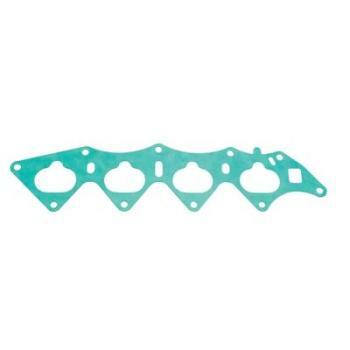 These gaskets also work with most stock cylinder heads and intakes, aluminum or cast-iron, as well as other aftermarket components. Top quality Edelbrock gaskets ensure a perfect seal every time. Matched to Edelbrock Performer and Performer RPM cylinder heads and manifolds, our Intake Gaskets allow for optimum flow and performance. The new MP-2N Micropore® technology does not use solvents making our gaskets environmentally friendly. Impervious to most chemicals, this synthetic fiber composite provides a high recovery under load. This means that when compressed, the gasket will conform to any imperfections on the sealing surface even using lower flange pressures. A nitrile bead around each port opening makes the seal even better. Edelbrock Exhaust Gaskets are made of EnCore™ HTX-900; a high-density non-asbestos fiber/metal core composite material consisting of two graphite coated, heat resistant fiber blended sheets that are mechanically and chemically fused to an expanded steel core. The finished product provides high heat resistance, excellent load retention and unmatched sealing performance on exhaust manifold and header applications. A 50% recovery rate allows for gasket expansion in the event your header loses the proper header bolt torque. Fabricated from performance CRC (core-reinforced-composite), Edelbrock Valve Cover Gaskets provide excellent sealing integrity and conformability for easy installation. The multi-layer construction has two highly compressible, high rubber content, fiber-reinforced outside layers which are chemically bonded to a high strength composite core. This unique core-reinforced construction has a radial strength to resist high-vacuum or blow-out conditions. Edelbrock replacement gaskets are made to our high standards of quality and performance. They’re the same high quality gaskets that we supply with our intakes, heads, carbs and other components.